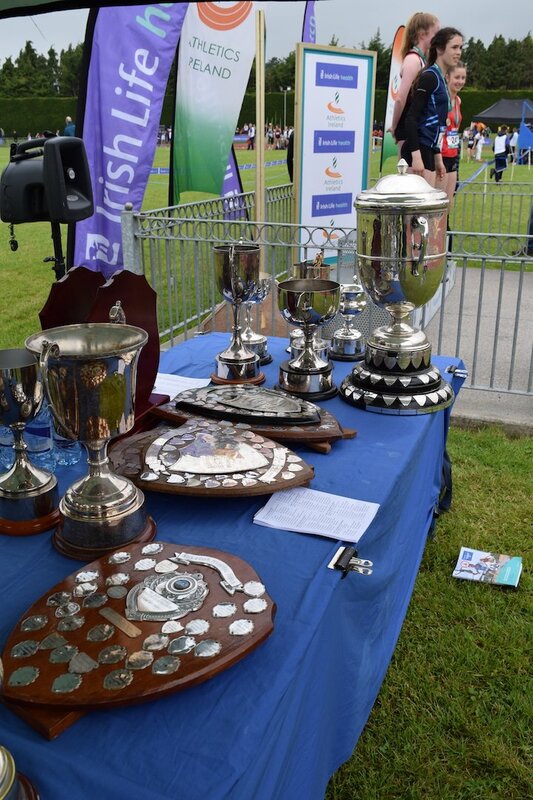 The annual Irish Life Health All Ireland Schools Track and Field Championships is one of the highlights of the athletics year in Ireland. 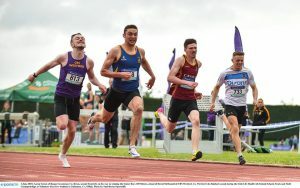 This year was no exception as athletes from throughout the land gathered to do battle in an overcast but warm Tullamore on Saturday last. Lystus Ebosele, Coláiste Bríde Enniscorthy, bagged one of only two Golds for Wexford with a brilliant win in Senior Girls Shot Putt (4kg). Her best effort of 11.55m was almost 1.5 metres clear of 2nd place. Ryan Carthy Walsh of Good Counsel, New Ross jumped 2.05m to take the Gold in Senior High Jump. With the Leaving Cert looming Ryan has, for the past weeks, put revision ahead of athletics so he was happy to do just enough to take the win. 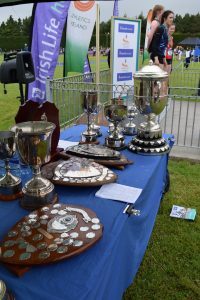 While there may only have been two Golds to report there was much to cheer about from a Wexford perspective with a good number of athletes making the podium and more than a few near misses. The Senior Boys 100m provided one of the races of the day. David McDonald of CBS Wexford crossed the line in a fantastic Championship Best Performance of 10.52 secs; so too, however, did Bangor Grammar’s fleet-footed rugby prodigy Aaron Sexton. When the time-keepers looked to thousandths of a second to try separate them, the Bangor boy edged it. Silver for David. The time puts both athletes 14th on the all-time list. The two provided more edge-of-seat drama in the 200m. As they rounded the bend the Wexford lad had the advantage; down the straight he looked strong, composed and in command; metres to go and the powerfully built Sexton somehow got his nose in front to take the win in 21.12 secs. Another Silver for David, his time 21.26 secs. One hopes that CBS Wexford appreciates what a unique talent they have in McDonald and the honour that he has brought to the school on the national stage. 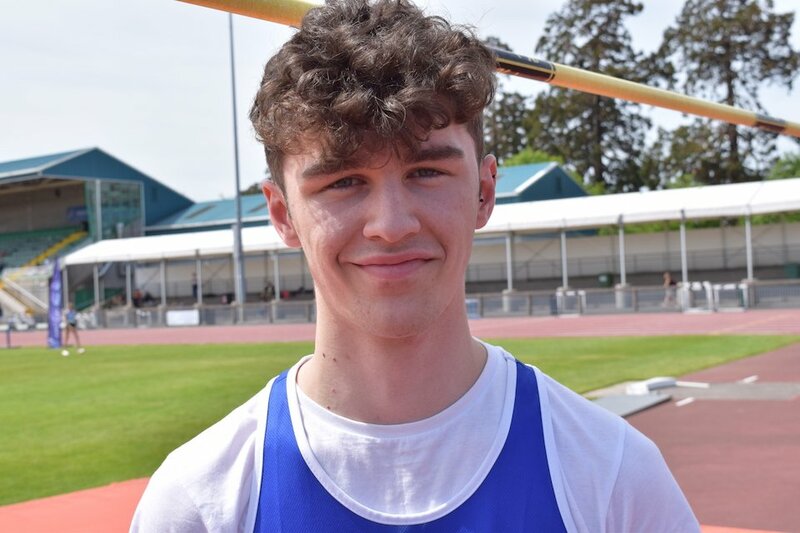 All-Ireland Combined Events Bronze medalist Saidhbhe Byrne, Coláiste Bhríde, Carnew was 5th in 75m Hurdles (12.16s) and 4th in Shot Putt (9.89m). Triini Jurisoo, Presentation Wexford, was 7th in Junior Hammer (2.5kg) with a distance of 35.88m. Aisling O’Brien, St Mary’s New Ross was 10th. Brídín Doyle, Coláiste Bhríde Carnew, was 7th in Junior Walk (6.30.24 mins) while Aoibhínn Crean, Coláiste Bríde Enniscorthy, placed 10th (6.42.83 mins). Ellie Cooney, St Mary’s New Ross, placed 6th in Junior Triple Jump (8.86m). Joshua Hewlett, CBS New Ross, won a Bronze medal in Intermediate Javelin with a best, and new pb, of 56.20m. In Inter Boys High Jump Jack Forde of CBS Wexford had clear rounds up to and including 1.85m, a pb. With the bar then moving up to 1.88m it was always going to be a big ask for the talented multi-eventer and current All-Ireland U16 Combined Events Champion. He came up just short and ended the competition in 4th spot. Earlier in the day Jack placed 8th in Triple Jump (11.96m). Gergely Pap, also CBS Wexford, won a Bronze medal in Inter Shot Putt (12.80m) as well as placing 5th in 1.5kg Discus (37.16m). Dara Casey, St Mary’s Enniscorthy, was 7th in Inter 100m Hurdles (14.85s). 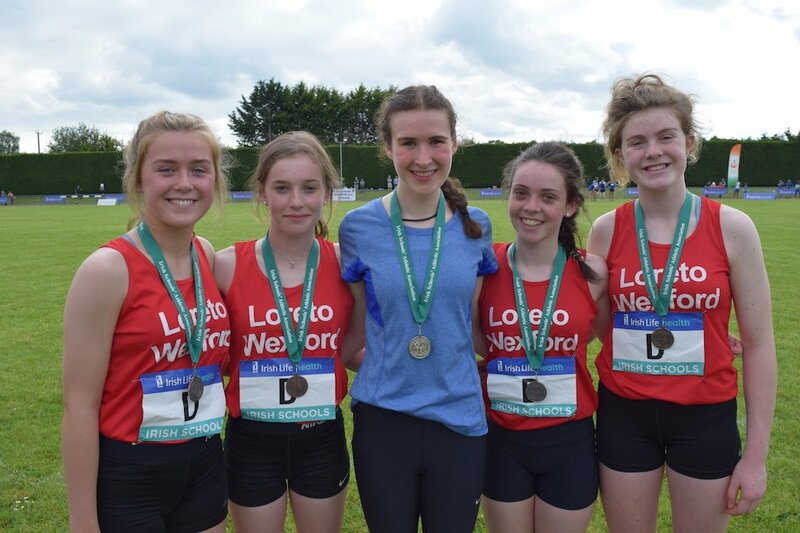 Róisín O’Reilly of Loreto Wexford claimed her first ever national medal as she took the runner up spot in Inter Girls 1500m Steeplechase in a new best time of 5.18.62 mins. Róisín, who has only recently taken to the event, looked strong throughout and was just 5 secs adrift of the leader at the finish line. Of no less importance was the fact that she was a mere 0.09 secs ahead of her nearest pursuer! Later in the day Róisín lined out in the 1500m, this time with no barriers to negotiate. Her earlier exertions saw her fall off the pace on the second lap. She found hidden resources on the final lap to rally, crossing the line in 4th spot, just one sec behind the Bronze medallist. Fellow Loreto Wexford girl, Maeve Hayes was 8th in Inter High Jump (1.50m). 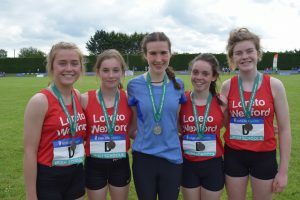 Wexford is currently blessed with a number of sprint specialists and last Sunday four of these line out in the Inter Girls 4x100m with just one destination in their sights: a podium place. Liadh Dwyer took off from the blocks and powered around the first bend, passing cleanly to April Keeling; April powered down the back straight, holding some, gaining on others, and handed to Rachel Power who maintained the tempo around the final bend; as the stagger unraveled, Loreto found themselves in 5th spot; all down to Aisling Kelly on the anchor leg; she passes one, going like a train; she passes another; no more track. Bronze! Loreto Wexford’s strong overall performance at Intermediate level meant that, when the points were totted up, they finished 3rd team behind St Flannan’s, Ennis and St Vincent’s, Dundalk. Kate Jackman of St Mary’s New Ross placed 8th in Inter Girls Javelin with 27.60m. 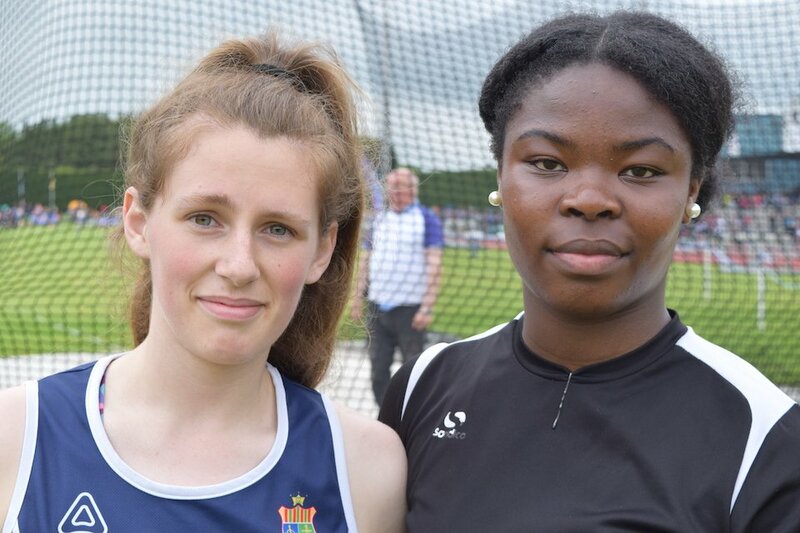 Her school-mates Tara Doyle and Grace Cloney competed in Inter Triple Jump with a 6th place finish for the former (10.39m) and 9th for Grace (9.86m). Éadaoin Stafford, Coláiste Bríde Enniscorthy, placed 9th in both Inter Discus (1kg) and Shot Putt. In Senior Girls Discus (1kg) Marguerite Furlong of St Mary’s New Ross won a Silver medal with 35.86m being the best of a consistent series of throws. Lystus Ebosele, with a Gold medal already to her credit, had to be content with a 5th place finish (29.65m). 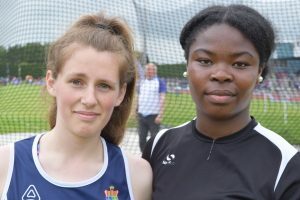 This was a good result for Marguerite but not so good for Lystus who threw over 5 metres further at the Leinsters and almost 10 metres further at the recent AAI Games. Any time an athlete doubles up there is always the risk that the exertions of one event may impact negatively on another. Lystus knows this and will not be fazed by the outcome. Amy Forde, Loreto Wexford, threw a pb 34.89m in the Senior Hammer (4kg) to take 4th place, just under one metre off 3rd. Tríona Mooney, St Mary’s New Ross, placed 5th in Senior 3km Walk (17.37.19 mins). 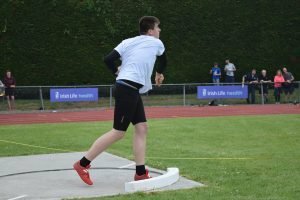 Pádraig Hore, CBS New Ross, took the Silver medal in Senior Discus (1.75kg) with 43.08m being his first, and only, successful throw of the competition. 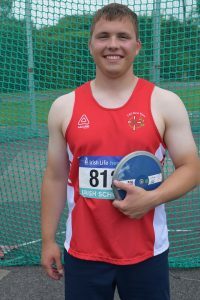 He also placed 5th in Senior Shot Putt (6kg) with 12.35m. 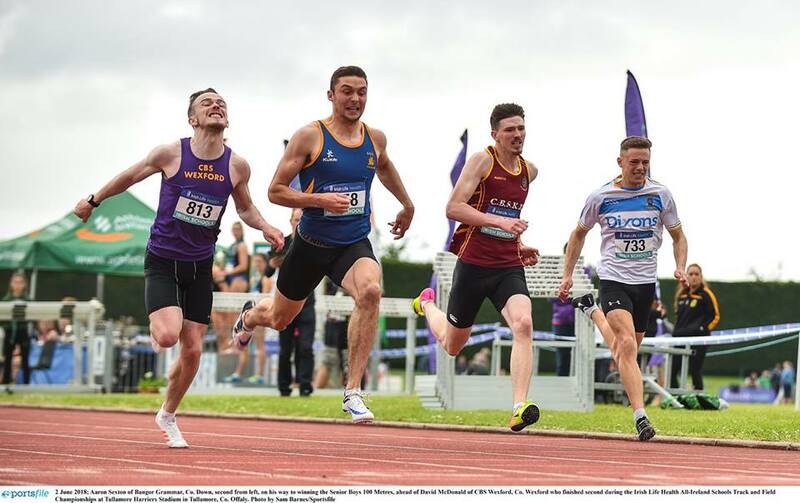 Tagged All Ireland Schools Track and Field Championships, Wexford athletes impress at All-Ireland School’s T&F. Bookmark the permalink.